The XBOX Shmup catalog is like the Rollercoaster Ride of Life of 4Him's "The Ride": Lifts you up and lets you down, the same predicament goes for the Nintendo Switch and the PlayStation 4. So as you go "through highs and lows and all those in between", you can find good things like Boiling Bolt, Blazing Star, Ikaruga, Triggerheart Exelica and Raiden V or just a waste of money and time like We Are Doomed, Ghost Pilots and this game: Xenoraid. I'm not gonna "do Round-ups" to sum this thing up. So better start reading before picking this game. 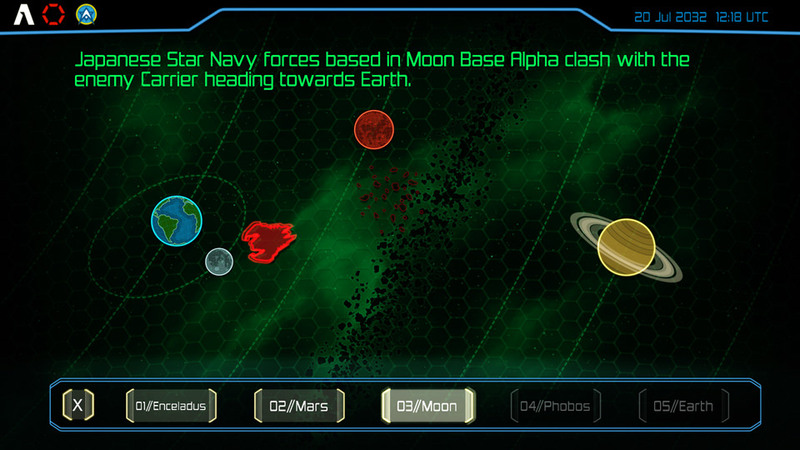 This is RISK in the future: A 5-in-1 Galactic Conquest game featuring the Solar System's most frequent battlegrounds. To begin with, this game gives you two play options: "Play" and "Survival". "Play" is the Main Game, here you can decide if you want to play it alone or with a friend in Co-Op. This game features 5 campaigns in different places of the Solar System: Enceladus, Mars, Moon, Phobos, and Earth. Each sector is splitted in 11 Missions (10 Stages + Boss Stage). 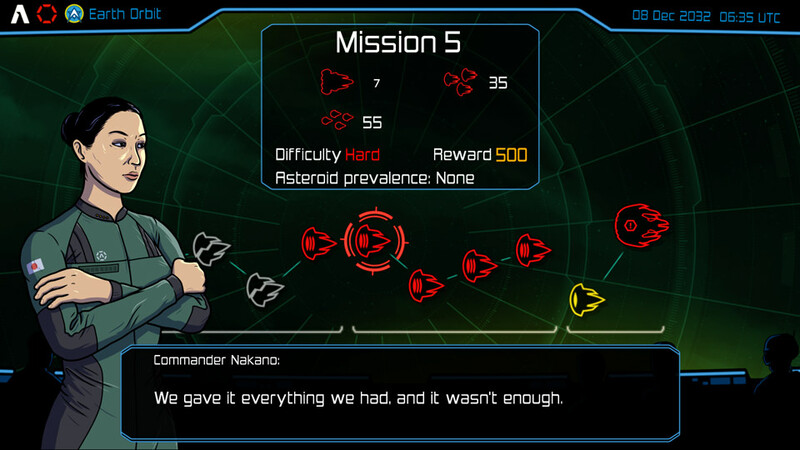 The difficulty of the stages varies depending on multiple factors: Number of enemies, Type of enemy used and Asteroid prevalence. The everyday life of an Earth pilot: Sent to Saturn's orbit and greet the unwanted guests with his/her artillery. NUMBER OF ENEMIES: Like in G-LOC Air Battle, You'll be required to shoot down a certain number of enemies in order to advance to the next mission. Sometimes you'll face 60 enemies or 120 in total. 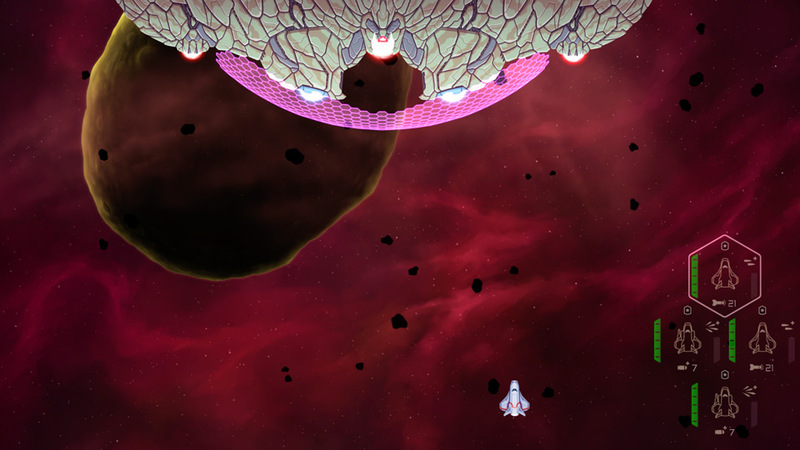 TYPE OF ENEMY USED: Not all the enemies are the small ship formations. As you progress in the game, the alien fleet will throw you larger Destroyers and Cruisers which can take more damage and even use shielding. 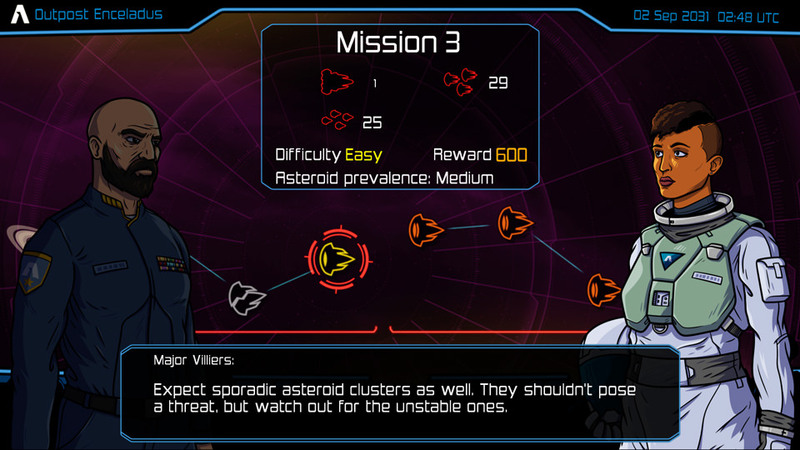 ASTEROID PREVALENCE: The "Space Weather" plays a challenge factor in this game. The asteroids are an obstacle, not just for you, but for the enemy as well, since they can end up crashing with a space rock regardless of its size. Each campaign is splitted in checkpoints that can be reached once you cleared 3 stages, this is where the game saves your progress if you have to leave. In total, there's three checkpoints per campaign. Hail Mary Device: Peace sells, and War's buying. 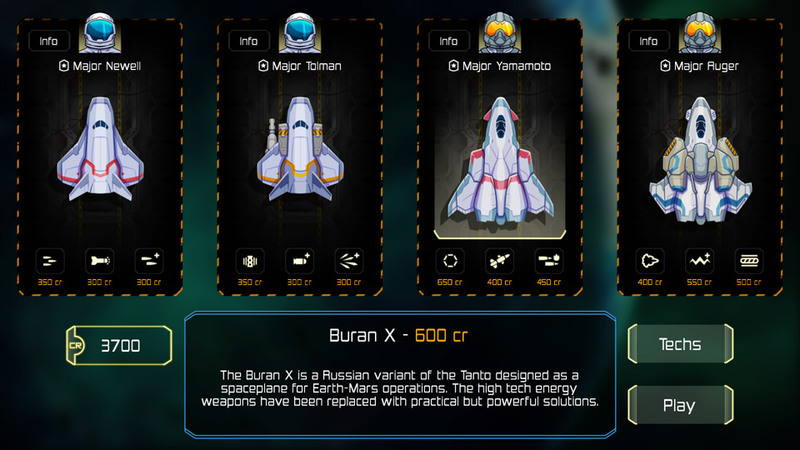 During your campaigns, you'll have the option of upgrade your fighters and technologies. 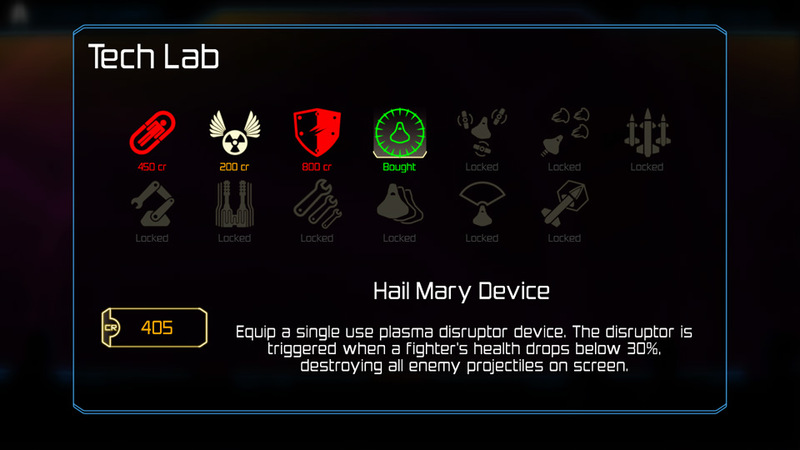 Tech Lab focuses on adding technological solutions which will improve your fighters and add discounts in the Fighter Bay. The Fighter Bay is your Hangar where you can buy and sell your fighters, but also invest in weapon upgrades. All of this upgrading and ship investment means one thing: "Goin' all U.N. Squadron", that means another "Money Investment Shmup" and Xenoraid reminds me of the SNES port of U.N. Squadron. The game gives you an initial amount of money to spend on a few ship upgrades. The rest is up to the mission progression and avoiding damages since players have to pay for the repairs. Buying a new fighter also means hire a new pilot, and with him the chances of surviving a stage. Knowing each fighter and its weaponry is essential for select the most appropiate for any combat situation. During the first 3 campaigns, you can clear them all by just using the basic StarLite units, while the rest will forcibly require the Tanto and its Stealth Device to avoid the Destroyer's tracking "Free Range" detection. With a new pilot, anyone could expect a custom naming feature. You know, sometimes i wanna have in my fighter squadron pilots such as "Major Himejima", "Ensign Nitta" and "Captain Meiling", but instead, the game already choses the names for you, so you have no choice but to accept names like Captain Auger, Ensign Kao and Major Kobayashi, killing the creativity of custom naming with the game's preset names. Sometimes things are too big that they only occupy the upper side of your screen. 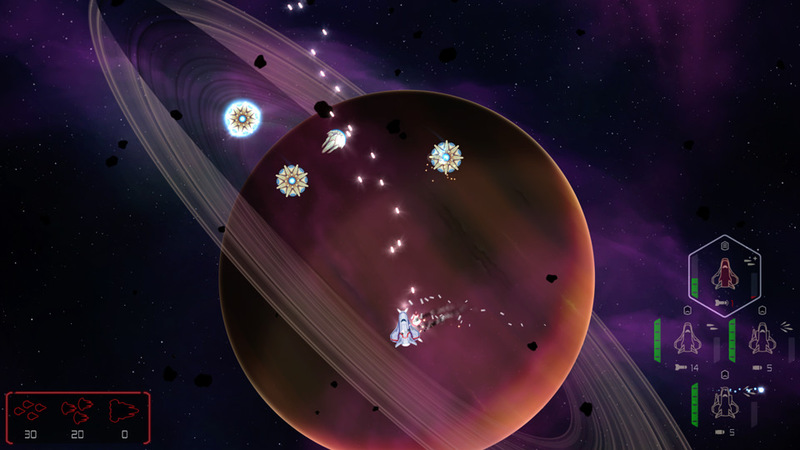 The gameplay of Xenoraid is a vertical shoot-out where the main objective is to eliminate a certain number of enemies while surviving with at least one ship remaining. Rather than using lives, the game relies on the number of pilots in your squadron, which can be switched in the fly, just like in Rayging Blue's Conflict Warred, but in a much more functional manner: using the main buttons to send a specific pilot. That's right, Xenoraid is a "Team Tactics Vertical Shooting Game" where you decide who goes to the battle and who to retreat when it takes too much damage before being destroyed. If the main buttons are for pilot change, then you might be asking "How do i shoot? ", the Trigger Buttons are your firing buttons. Left Trigger is your Special Shot, while the Right Trigger is your Fire button. A control scheme similar to FPS games rather than traditional shooting. You can also enable or disable the ship tilt while moving for a more basic, linear firing, but doing this could make your battle strategy less efficient than using the ship tilting in your favor (Hint: Sometimes firing at an angle could be the key to clear the mission). Asteroids aren't just a frequent hazard, there's a couple of instances where you can use them on your favor: Sometimes, you'll see asteroids with blue or yellow Lava on their surface. Destroying a Blue Lava Asteroid will release Crystals which can be picked for a few extra credits, while the Yellow Lava ones are a "natural bomb" as they explode, releasing debris and a large explosion, becoming a double effect weapon. Ummm...nothing, nothing that we've did wrong, you know. Obviously GoodBeam arms aren't very good at taking heat. Now for the bad news, and there's quite an amount of them. Starting off with the money. I'm not talking about the idea of using money investments, i'm talking about you can't carry the money you had on a campaign to the next one. So if you had 2350 credits on Enceladus, your money will be resetted to a default number (around 1500 or so), while in the second and third campaigns can be annoying, it becomes almost frustrating in the final two because you'll have to spend on more technologies and buying better fighters. Speaking about fighters, this game pulls the X-COM Permadeath crap on your pilots. That means if your Major goes down, he's gone forever along with his ship and you have to buy a new fighter, upgrade it if you can, and start with your new Ensign from scratch. Fortunately, you can avoid losing pilots by pausing the game and selecting "Retry". Also, there's no "Slow recovery" when any of the ships is not in the field. If we compare this again with Rayging Blue's Conflict Warred, you'll remember the unused ship regenerates its energy. In Xenoraid that would be very convenient rather than paying the repairs, specially since paying for one repair doesn't fully replenish the ship's energy gauge. There's no in-game items either to replenish your energy or special ammo except for the crystals released by the Blue Lava Asteroids. But what i think is the mother of all flaws is the weapon Overheating. Firing constantly will overheat the weapons rendering useless for a while. In R-Type III The Third Lightning the Overheat only applied on the Charge when the R-9O used it's Hyper mode the ship was still able to shoot. 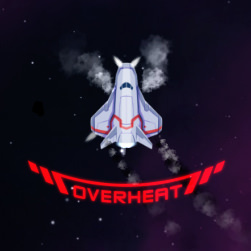 In Xenoraid, the Overheating turns your ship into an easy moving target. Although there's an upgrade in the Tech Lab to reduce the heating, it doesn't help much in solving the problem. Completing the 5 campaigns will unlock the Hard Difficulty, which means you'll have to play the game once more. Select Your Triggerheart...oops, wrong game. Survival is the typical "Endless Wave" mode where you're pitted against a never ending assault of enemies. 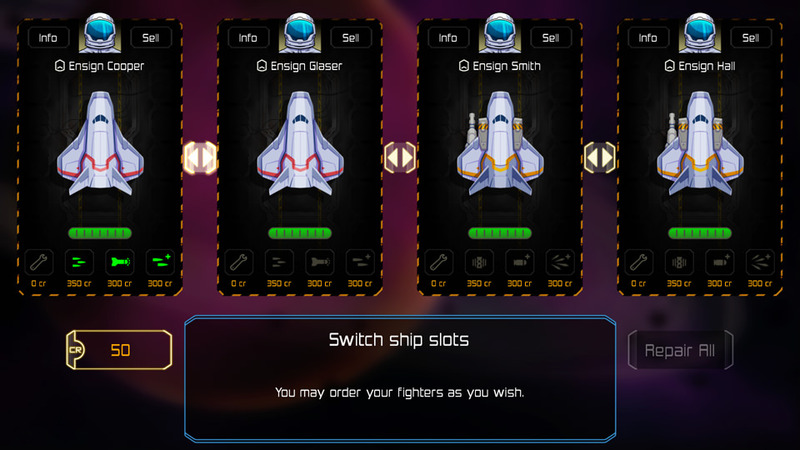 Unlike the "Play" mode where you had to enter the Fighter Bay to buy ships and upgrades, you can select which ship do you want in your squadron. When your space defense force looks like they've came from NASCAR Racers. Graphically, the game is basically a mixture between a flash game and a 90's cartoon/comic book. Starting off with the ship designs, which range from small Space Shuttle look-alikes such as the StarLite series to more original starfighters like the Buran-X and Tanto, and a few Y-Wing wannabes. The enemies this time are a bizzare combination of organic and technological machinations which resembles sculpted rocks in some cases like the large ships and Destroyers. The cutscenes, are the typical still image with no dialogue. This time the artist (or artists) decided to use the western style rather than anime, but in Xenoraid, the character design looks like a mix between Exo Squad and NASCAR Racers, rather than military they look like extras from Fastex and Rexcore, while the drawing style evokes the 90's style coloring and shading of Exo Squad. But the most repetitive part is that the game is ALL in space, there's not even a single mission on a planetary surface or an atmospherical battle, just you, your enemies and the asteroids orbiting Saturn, the Moon or Earth, or just flying in the stars with some space clouds to make it more colorful. Not to mention, the ships aren't too animated at all compared with any other shmup on the XB1/PS4/Switch library, which is a fatal flaw, even for an Indie game. The game music is almost forgettable, with the exception of one theme, it appears in the soundtrack album as "Gameplay Theme 4", which is the best track of the whole game, as it combines the slight suspense with acoustic keys typical of a "crystal cave" themed level. The rest is your blend of suspenseful notes that attempt to create an atmosphere of tension. However, they end up becoming boring too fast. Also, if you restart a level, the track will change just like in Steel Rain X. This is one of those games that makes me miss the "Custom Soundtrack" feature of the original XBOX; Shut the game OST up and play your music. Overall, we're facing a bland shooter that despite its little interesting features and its lone "good" song in the soundtrack, it has nothing special to offer in gameplay if we compare it with other titles like Raiden V, ACA Neo-Geo Aero Fighters 2 and AIPD. The only reason to pick this one up is if you only want to get some quick Gamerscore points in your console, because Xenoraid is just like We Are Doomed; one of those "Buy-Play-and-Forget" type of games. Just buy it if its in offer or when the "Free With Gold" day comes. To quote Blazing Star: YOU FAIL IT.